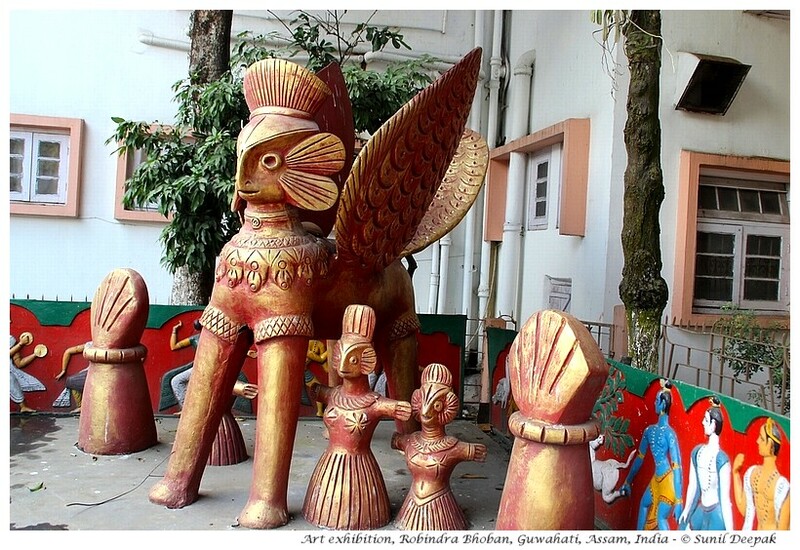 A small area of Guwahati called Uzan Bazar, located between the south bank of Brahmaputra and the city railway station, is the most culturally and historically rich part of the city. The ancient pond of Dighlipukhuri is placed like a jewel, at the centre of this area. Since the area has so many places to visit, this walking tour is divided in two parts. 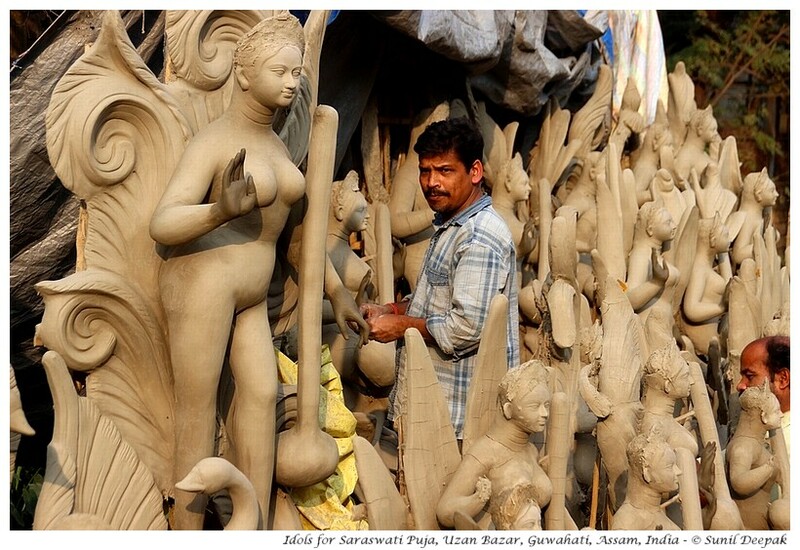 The image above is from a small lane close to Dighlipukhuri and shows the preparation of Saraswati idols in preparation for the Saraswati Puja festival. This first part of the walking tour focuses on the Dighlipukhuri pond and the area to its south including the Assam State museum, the state library, Robindra Bhoban cultural centre, Ambari archeological area, Cotton college and Nehru Park. Let’s start the tour by a brief introduction to the history of this area. Uzan Bazar is very well connected by public transport. You can get down at Dighalipukhuri and then easily walk to all the places mentioned in this post. Ambari archeological area was discovered in 1960 and excavations are still going on. They show that this area was an important cultural centre in the ancient Kamrupa empire, when Guwahati was known as Pragjyotishpura. The excavations have shown constructions and artefacts from two periods – from 8 to 11th century CE and from 13th to 18th century CE. An artist guild with production of sculptures was located here. Glazed terracotta potteries, Kaolin pots and Celadon wares found here show that the area was an important trading centre in the medieval period. Due to high level of subsoil water in the area, deeper digging was not feasible here. During the British times, building of railway tracks and construction of the Paltan Bazar railway station, brought a different kind of development in the area. While the capital of the British Assam was in Shillong, important buildings in British colonial style were built here. According to Assamese writer-historian Kumudeshwar Hazarika, in 19th century, when the British had arrived in Guwahati (then known as Gauhati), there were around 300 ponds in the city. Pond-construction was seen as one of the duties of the kings, and often ponds were built to thank or to mark some special occasion. In 19th century, most of those ponds were filled. However, Uzanbazar area still has some of these ponds. Dighlipukhuri is the biggest and oldest of all the ponds of the city. I don't know how big a water body should be, to be considered a lake, rather than a pond - probably, Dighlipukhuri is big enough to be called a lake. 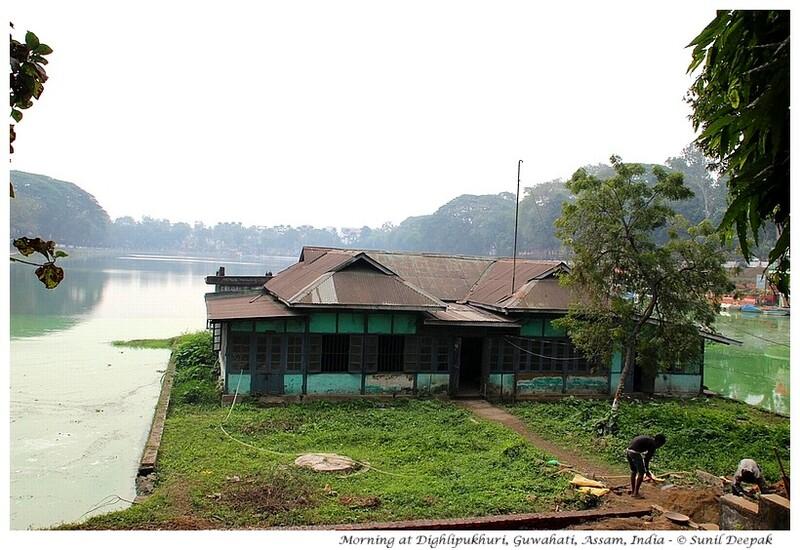 Dighlipukhuri, built during Ahom empire, was earlier connected to the river Brahmaputra in the north by a canal and used as a boat-port. This canal was closed and the European club was built here by the British, which is now used as part of the High Court (old campus). To the south, the pond also connected to a marshy area called Shola Beel. This area was covered when Paltan Bazar railway station was constructed. Dighalipukhuri has a children’s park, a boat club and paddle boats for the tourists. It is a great area for the morning and evening walks, though during office hours, it is a little noisy with the traffic rush. Assam state museum and the central state library are both opposite the south end of Dighalipukhuri. 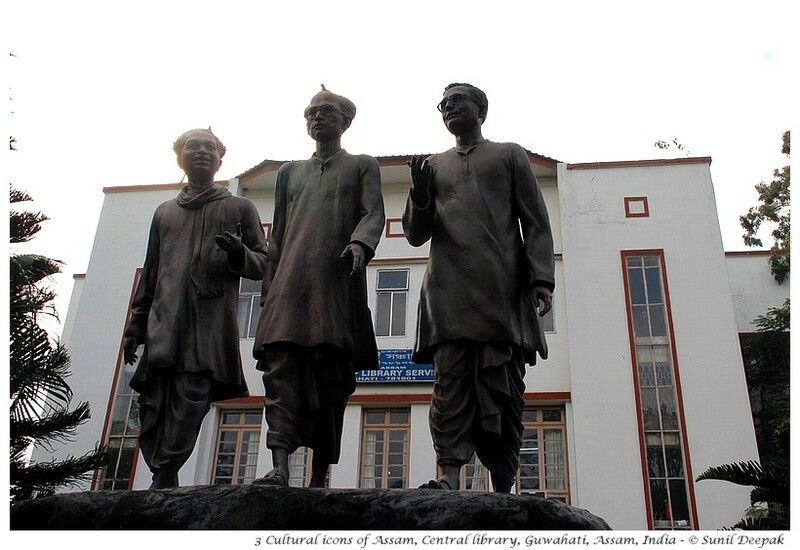 The library courtyard has the statues of three of the famous Assamese cultural icons of 20th century – playwright, writer and film maker Jyoti Prasad Agarwala, pioneer of music and art Bishnu Prasad Rabha and actor-director Fani Sharma. Unfortunately India does not have a tradition of honouring its cultural icons, and most of the public statues are reserved for politicians. Guwahati and Assam are probably an exception to this trend. I did visit the state library and museums for cultural events but not for their original purpose. Thus, I never managed to see the books in the library and to visit the exhibits of the museum. 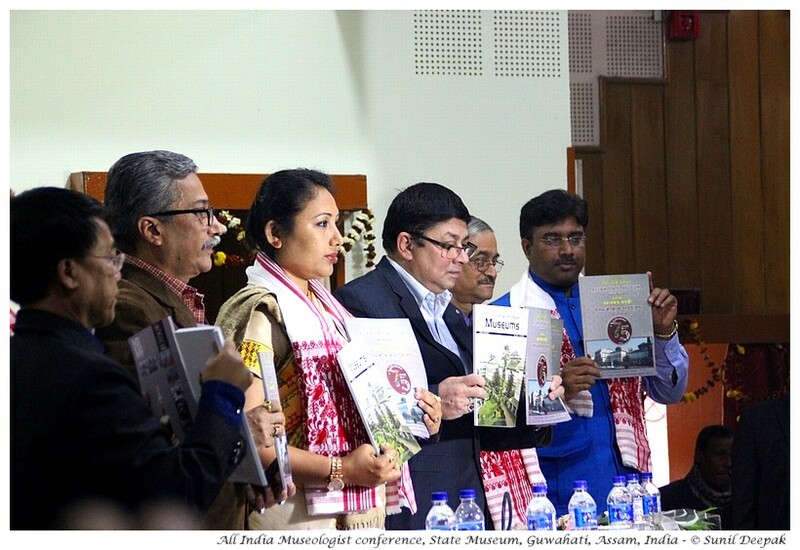 Instead, I participated in the cultural events held in their premises such as the annual conference of Indian museologists and the Indian youth festival, presented in the two images below. Close to the state museum is Robindra Bhoban cultural centre that has a rich programme of plays, dance and other cultural events through out the year. The building also hosts a cultural museum which I never managed to visit it as well – finding it closed the couple of times I visited it. The image below shows an art exhibition held in its courtyard. Like Kalakshetra, the other important cultural centre of Guwahati, even Robindra Bhoban (Bhawan) does not have a proper website or facebook page or even an email mailing list to get information about its events-programme. Thus, unless you live in the area and can check its billboards regularly, it is not easy to be updated about its activities. Under the “History” section above, I have already given some information about the significance of Ambari archaeological area. It is a five minutes’ walk from Robindra Bhoban. The area is part of archaeology department of Guwahati university. Here you can see the remains of the medieval houses of the old city as well as visit the small but nicely maintained museum that has many artefacts from 8th to 10th century and from medieval period, discovered in the diggings in this area. 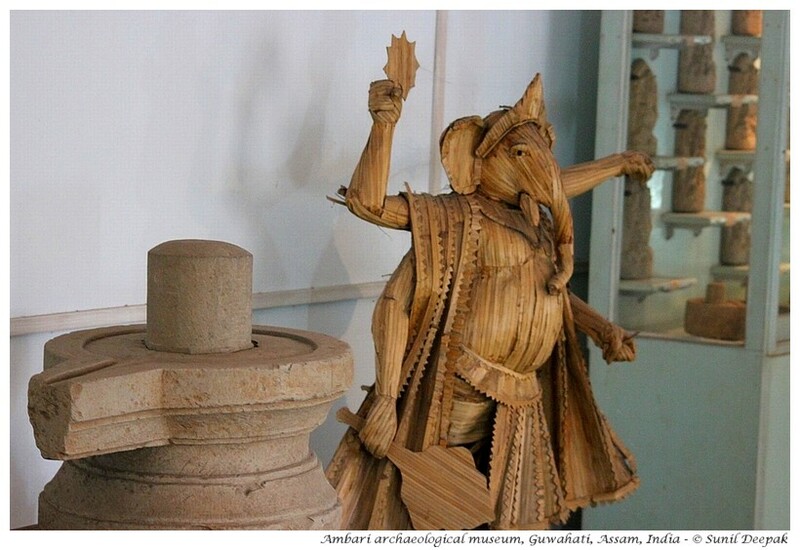 The image below shows a 10th century Shivalinga and a medieval bamboo statue of Ganesh from the Ambari museum. A side road near Dighalipukhuri, takes you to Cotton college and Nehru Park. Cotton college is one the old institutions of higher education in Guwahati, established in 1901, during the British colonial rule. It was also an important centre of the freedom movement in the north-east. With its wide open areas, low colonial buildings and huge ancient trees, Cotton college is a beautiful area. 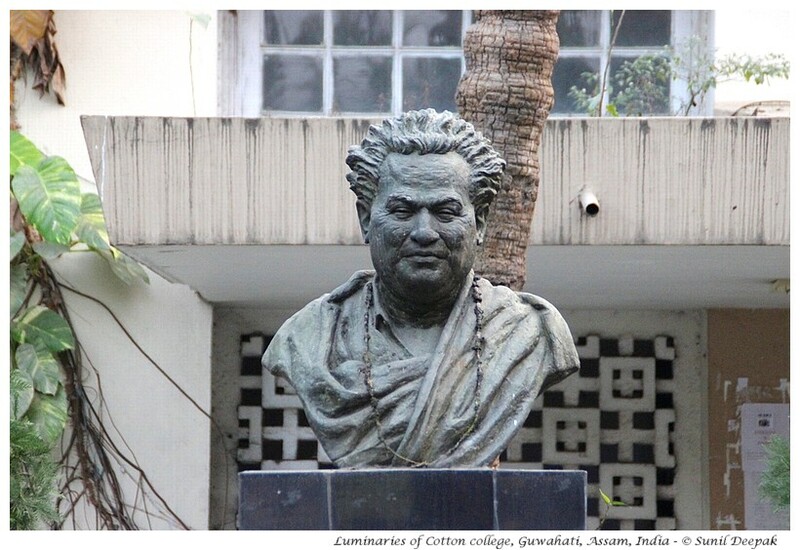 The image below has one of the busts of the luminaries of Cotton College, which include Bhupen Hazarika. 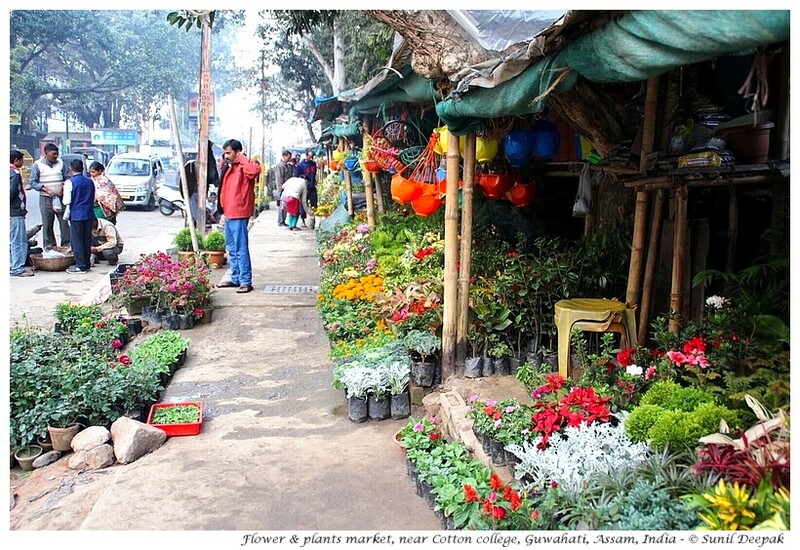 Near Cotton college, a picturesque street going towards the river has the shops of flowers and plants-sellers. This part of the city has been beautified by bas-relief artistic panels fixed along the walls of the buildings facing Dighlipukhuri. 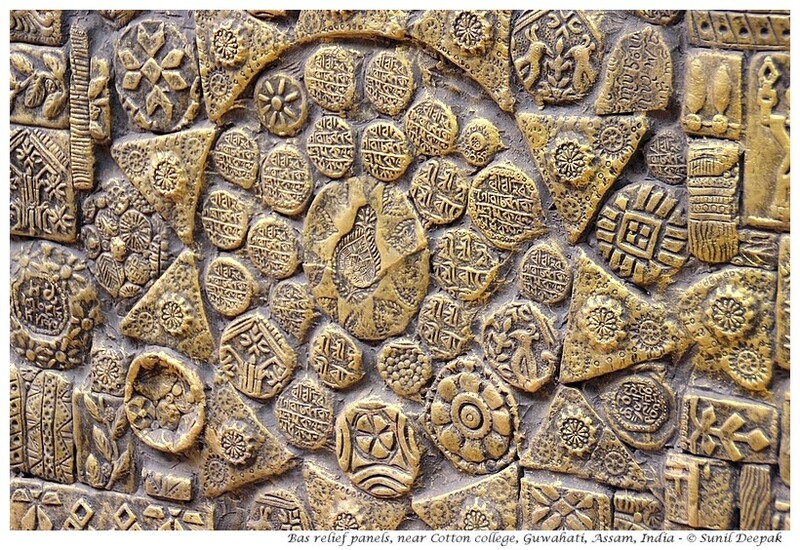 The image below presents the details of one such panel. Similar panels have also been put up in Dispur. As far as I can tell, each panel is a work of art, different from all others. I wish that the city would give recognition to the artists of such works by indicating their names near each panel. The entrance of Nehru Park is from the Cotton college road. 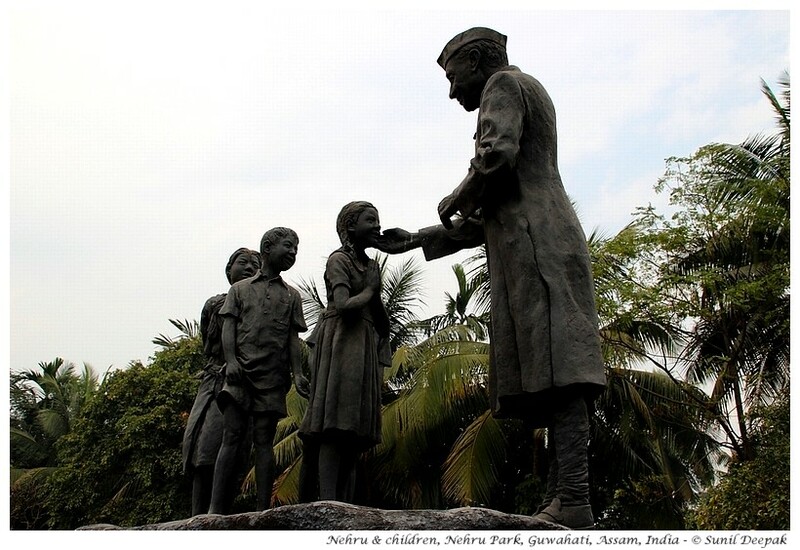 It is a nice garden with a lot of sculptures, starting from a nice group of terracotta statues including India’s first prime minister Jawaharlal Nehru with three children. Close to the entrance, the garden on the left has terracotta statues presenting the different dance and music traditions of Assam. 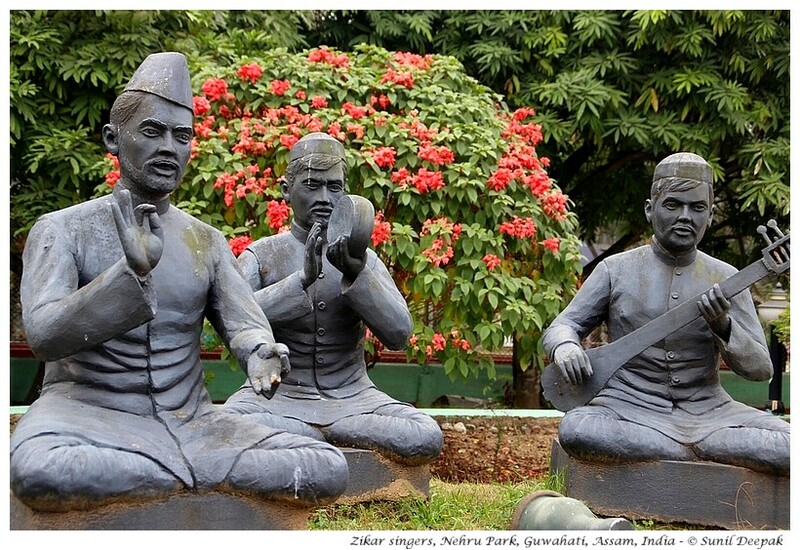 The image below presents the Zikar singers, a traditional art form of Assamese Muslims. Another favourite area of the park is close to its other border towards the river, which has a Bhul-bhulaiyan (maze) made of shrubs, where once you enter, you can easily get lost and not find your way out (not so much for adults, as for children). 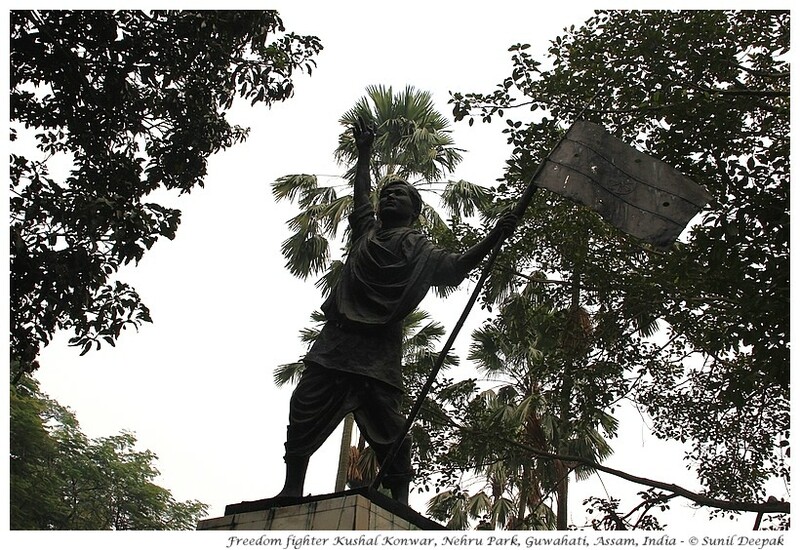 This area also has a lovely sculpture of Kushal Konwar, a follower of Gandhi ji and a believer in non-violence, who was hanged by the British in June 1943. Though formally Guwahati is not the capital of Assam and only the Dispur area of the city is called the state capital, the areas between Dighalipukhuri, state museum and library are popular venues for protest marches, public meetings and strikes to attract the government and public attention. Every time I went to this area, I always went around to see who was protesting or doing hunger strikes and for what reason. 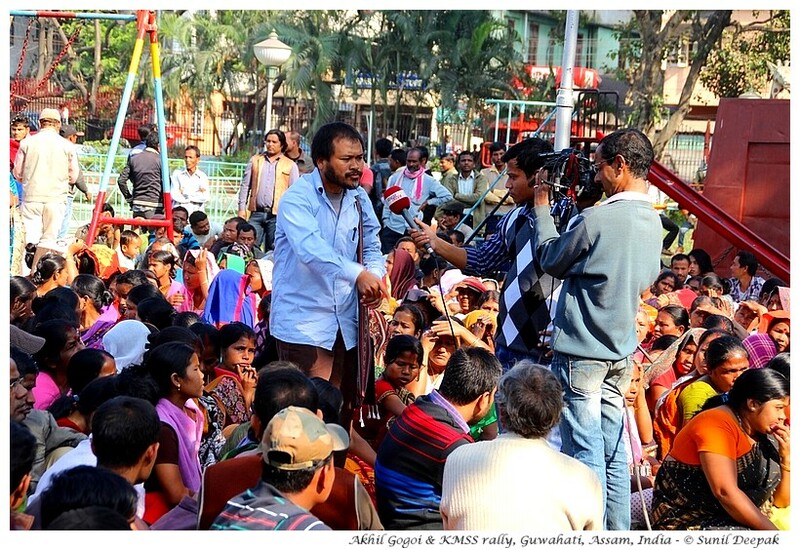 The image below is from the Dighalipukhuri park showing a meeting of the farmers of the Krishak Mukti Sangram Samiti (KMSS) with its leader Akhil Gogoi. 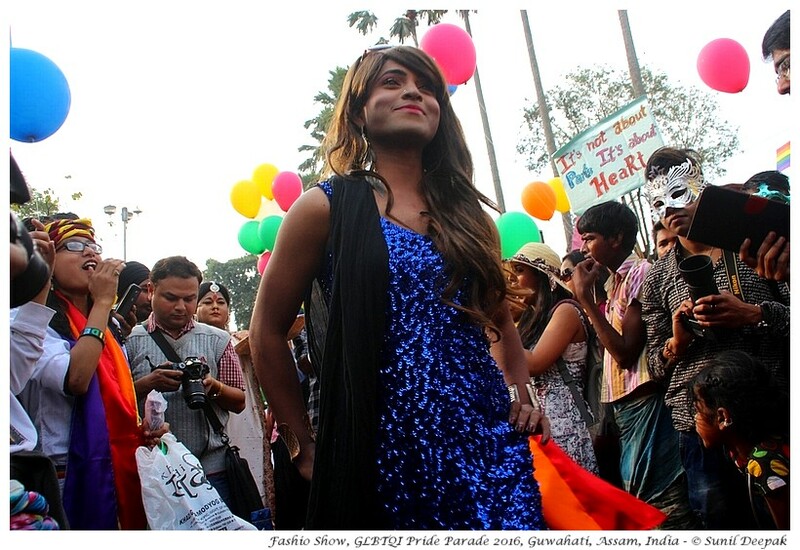 The next image is from a fashion show in front of the entrance to Dughalipukhuri park during the north-east GLBTQI pride parade in February 2016. For me, in terms of its importance to the soul of the city, this area can be considered as the “centre of Guwahati”. As you can see, there are a lot of places to visit in this part. I have touched on only some of those places in this post. The remaining places located to the north of Dighalipukhuri such as the famous Ugratara, Shukreshwar and Umananda temples, will be presented in the second part of this walking tour. 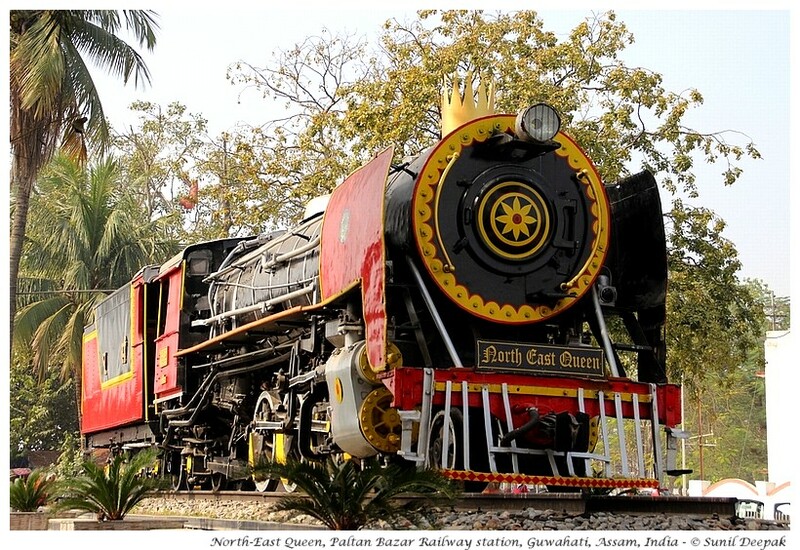 Let me conclude this post with an image of the steam train locomotiv of the North-East Queen outside the entrance to the Paltan Bazar railway station. This engine was built in 1956 and was in service till 1997. If you have little time and can not visit all the places mentioned in this post, I suggest that you shoud make an effort to visit at least the Dighlipukhuri lake and Nehru park. Read the second part of this post regarding the other places of interest in Uzanbazar.